Let’s go halibut fishing! Cook Inlet is famous for its healthy halibut population. The halibut are large and the bite can be incredible! Catching a daily limit of halibut is pretty normal on our fishing charters. That’s what makes Alaska fishing so incredible! Halibut average 20-50 pounds but catching heavier fish is common. Every year our customers have caught halibut in the 200-300 pound range! 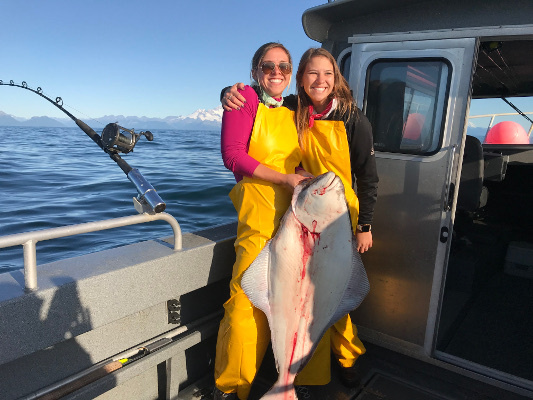 Come fishing with us and be prepared to go home with many pounds of delicious halibut fillets! 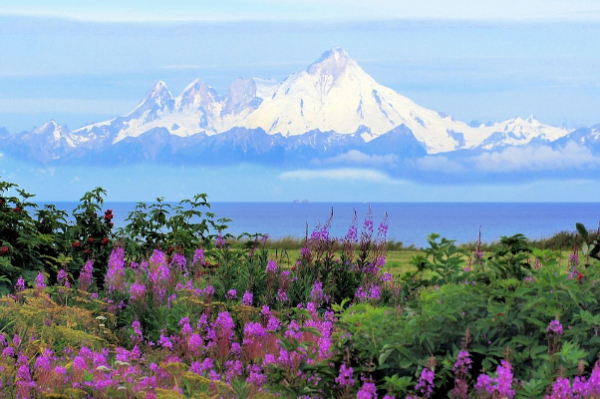 The village of Ninilchik is located on the Kenai Peninsula along the shore of Cook Inlet. It is a small fishing town that comes alive each summer when thousands of visitors join us to fish for halibut in our incredibly rich waters. Ninilchik is centrally located between Soldotna and Homer on the Sterling Highway. From Anchorage it is a scenic drive of about 4 hours. We run our halibut charters in Ninilchik because the halibut fishing is incredible! 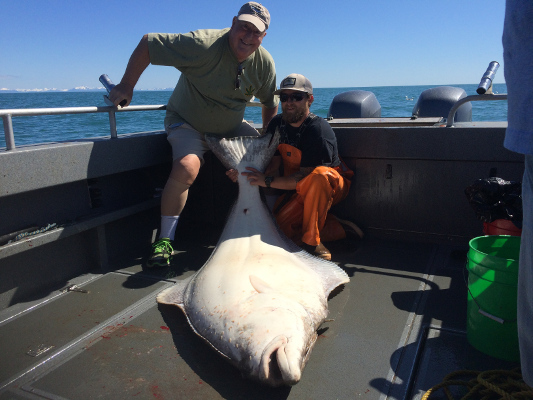 Cook Inlet has the best halibut populations and habitat available on the Kenai Peninsula. More importantly, Cook Inlet lacks the enormous fishing pressure that other locations such as Seward and Homer suffer from. Ninilchik is a hidden jewel that produces consistent catches of large halibut! Your Alaska halibut fishing charter begins with a unique method of launching. We climb aboard our boat at the Deep Creek Boat Launch and then we’re launched into the water by tractors. Most people find this an interesting beginning of their fishing day. Our boats are 28 foot North River Off-shores that can take 6 people fishing. Our captains hold U.S. Coast Guard Licenses and have 40 years of combined experience running Cook Inlet halibut charters. We can get you to the halibut grounds quickly and safely. Custom built for halibut fishing in Alaska, our boats are equipped with an enclosed cabin, large fishing deck, and marine restroom. Cook Inlet halibut are extremely strong fish and we are ready for them. The boats are loaded with 80 pound Penn Mariner fishing rods, and Penn Reels that are filled with 100-pound Power-Pro braided line. Heavy equipment for fighting those heavy Cook Inlet halibut. Most days you will have a short boat ride of about an hour to get to the best halibut fishing holes. During your boat ride you may see some of Alaska’s rich wildlife. Frequently you will see bald eagles on the beach as they search for food. While on the water, we often see puffins, whales, seals and otters. Three snow covered volcano’s tower above the scenic mountain horizon to the west. You will want to bring your camera to capture these fantastic views! We know that planning an Alaskan fishing vacation is a lot of work and we want everything to go smoothly for you. Whether you’re an avid angler or a novice, we will make every effort to ensure your fishing experience is a fantastic one. We want this to be a trip of a lifetime that you will remember for years. ​ We take reservations year round and are ready to help you arrange your Alaska fishing charters and accommodations. We look forward to helping you plan your Alaskan fishing trip! 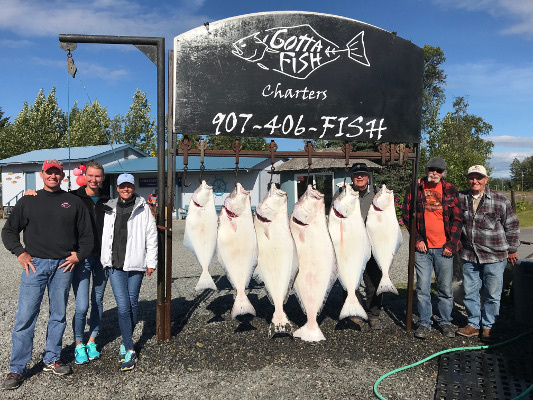 The captains of Gotta Fish Charters have spent the last 20 years running halibut charters in Cook Inlet. We fish nearly every day during the season. 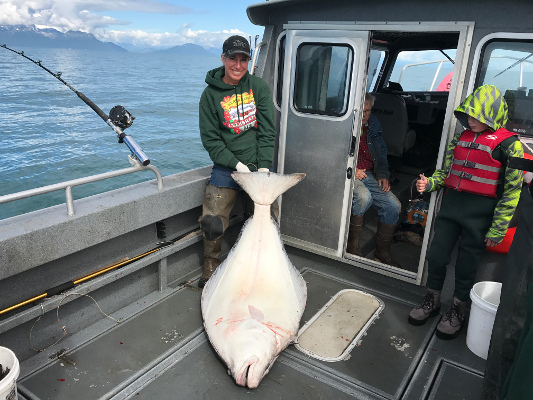 During the last 20 years, we have accumulated a tremendous amount of knowledge and understanding about Cook Inlet halibut. Gotta Fish Charters uses a variety of tactics to lure good halibut into the boat. Location, current, baits and lures are all factors we take into consideration while fishing. There is definitely an art to fishing big halibut! Any fish that can grow to hundreds of pounds is a successful predator! Halibut are aggressive powerful eating machines. We will do our best to put you on ‘em, but you’ll need to do your best to hang on!